Syrah V3 handles the dynamics in a way that allows you to be creative, without a complicated user interface. Syrah is a next generation dynamics processor that uses real-time detection and level dependent processing with true adaptive dynamic capabilities. Syrah is always trying to adapt its processing to the music and to the rhythm of the audio signal. Syrah is well suited as a creative processor for recording and mixing, as well as for delicate and demanding mastering tasks. Using parts of Flux's exquisite ‘BitterSweet’ technology, our new adaptive-dynamics technology, and our well-recognized level independent dynamics processing, Syrah will be well suited as a creative versatile processor for recording and mixing, as well as for delicate and demanding mastering tasks. The controls are not the usual type found on a dynamics processor, instead, the controls provided typically affect more than one parameter in the underlying algorithms, with everything carefully tweaked allowing for creative processing still ensuring the finest sound achievable. The built in preset manager and the preset morphing slider, provides instant and intuitive control of all parameters and controls. In a second, with a simple one-click operation, everything is copied from one of the two preset slots to the other. even during playback. Except for only A/B comparing two set of parameters, the morphing slider will allow for mixing them, and if desired, record the morph with the host automation. With the built in preset manager, you can save a complete snapshot (called a Global Preset) with all the settings from both of the preset slots, as well as the position of the preset morphing slider, allowing for instant recall of your morphing set. 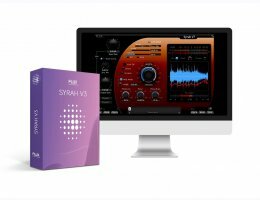 Syrah v3 is available in AU / VST / AAX Native / AAX DSP / AAX AudioSuite / Waves SoundGrid. Due to AVID Pro Tools changing to AAX, from Version 3 (v3) RTAS for AVID Pro Tools is no longer supported.